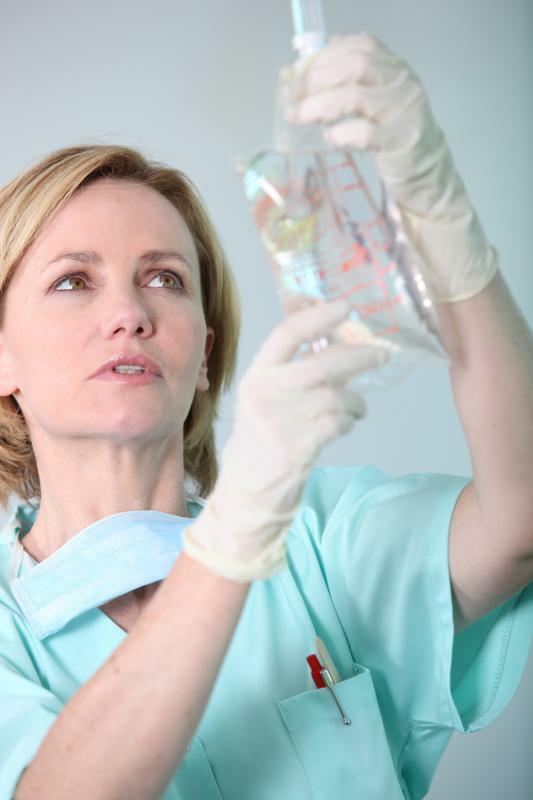 Some LPNs work in hospitals and are tasked with administering medication via IV. A licensed practical nurse (LPN) typically works under the supervision of a physician or a registered nurse (RN). He or she promotes health and provides care for sick, injured, or otherwise incapacitated persons. LPN jobs can be found in many locations, including hospitals, residential facilities, doctor’s offices, and private homes. An LPN may also work in a primary care clinic or act as a community educator. Still others work for government agencies as public health nurses. Most types of LPN jobs depend on one’s particular training and level of experience. In general, LPNs can perform a variety of tasks. They typically take a patient’s history and record his or her vital statistics. They usually observe and report changes in a patient’s condition as well. LPNs can also provide basic treatments, such as administering medications and dressing wounds. They frequently collect samples for laboratory tests, and they can prepare equipment for the other members of a medical team. The majority of LPN jobs are usually found in hospitals and nursing care facilities. Hospital nurses may be assigned to one department, or they may rotate to where they are most needed. LPNs in nursing care facilities generally work with long-term patients. In addition to completing practical medical tasks, LPNs often have to do administrative work, such as completing patient forms. In many cases, they work with families to educate them about properly caring for their loved ones. Additional examples of LPN jobs include office nurses, home health nurses, and occupational nurses. Office nurses typically work in clinics and private doctors’ offices. A great deal of their work is often administrative in nature. Home health nurses are usually hired by families or agencies to provide individualized care in a patient’s residence. Occupational LPNs generally work for businesses, providing medical consultations to the employees and their customers. To become licensed and obtain an LPN job, candidates must graduate from an approved nursing program and pass a licensing exam. LPN jobs typically require the supervision of a registered nurse (RN) or a physician since there are often more complex tasks that they are not permitted to perform. To gain additional experience, many LPNs go for training to become RNs. Later, they may also supervise aides or nursing assistants. Through national certification programs, LPNs in the U.S. also can become certified to practice in specific areas, such as obstetrics, IV therapy, and gerontology, for example. How Do I Choose the Best Online LPN Classes? How do I Choose the Best Licensed Practical Nursing Program? What are the Different Types of Nursing Jobs in Nursing Homes? What are the Different Government Nursing Jobs?